Ah, your first apartment! Its all yours, no one there to boss you around or annoy you. Your first glimpse shows you how bare and naked looking it is. This is when you will begin to infuse your personality into it. The first basic step is to envision your dream domain. Are you into contemporary looks or do you prefer classic décor? Collect ideas by looking through home magazines or watching design shows on TV or the internet. Take measurements of your place. You need to know what will and will not fit BEFORE you shop, so as to avoid having problems lugging out large items later. This will also give you an estimate of how much paint you will need. If you choose to change the color of the walls, it might be a good idea to do so before any furnishings arrive. Drop cloths and tarps are important to use on the flooring or any furniture that may be inside. Ask family members or friends for donations. Some might have a large item such as a couch, or a dining room set they do not use, or want to get rid of and will be more than happy to let you take it off their hands. Remember that if you’re on a budget, beggars can’t be choosers, if the piece is good, it’ll do. Parents or grandparents may also have used or mismatched plate sets, or linens that can serve the purpose. See what they say, and if they are willing to sell their things that you like. You can always buy new once you have settled in. It isn’t in bad taste to have a housewarming party. Create a registry online with items ranging in price from not so expensive to very pricy and include a link to it in the invitation. If it makes you feel more comfortable, you can say that gifts are optional. This way your guests won’t feel obligated. Hang pictures or artwork on the walls. The best ideas come from things that represent who you are. This could be some culturally specific images. Add some style to your end tables, or entertainment area. Display candles or books accordingly. Fresh flowers add a little pop of color and a natural element to an apartment but are expensive to replenish constantly. House plants give life to a room and are easier to maintain. A furnished apartment is incomplete without 2 last things, food and toiletries. Ensure your fridge is full and toilet paper and toothpaste is stocked and you’re all set! 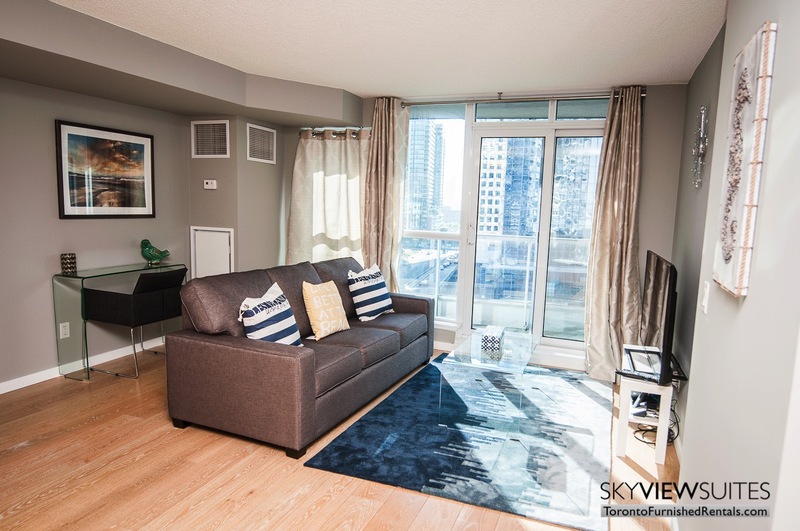 For more ideas on how to furnish an apartment, try staying at Sky View Suites, or look at their website: www.torontofurnishedrentals.com to see what a furnished apartment is all about.